This kit is the ultimate with ideas for practice with landforms. It involves posters, flash cards, writing, and more! For each idea in the package an overview of ways to use it is included. Photos are included to help you! Note: This package is available in money-saving bundles! This AMAZING set can be used in SO many ways! 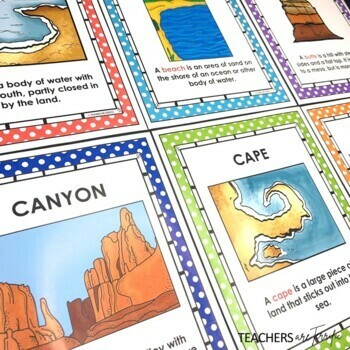 The poster set can be used to decorate a display all about landforms. 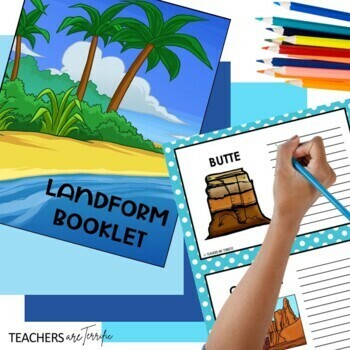 The booklet templates can be completed and put together as a landform booklet. The booklet templates are included with colored drawings and black/ white drawings. Each template has space for writing about the landforms. Flashcards may be used with games and for review of the landforms. Writing prompts are included and may be used in your writing center to help students cement their learning about landforms. The pack includes 28 landforms: bay, beach, butte, canyon, cape, cave, channel, cliff, delta, desert, glacier, hill, island, isthmus, lake, mesa, mountain, oasis, ocean, peninsula, plains, plateau, pond, river, sand dunes, valley, volcano, and waterfall. •	Matchbook fold-able template directions page; matchbook template page; colored drawings to use with matchbook templates. •	Writing Prompt Task Cards directions and ideas page; 2 pages of Writing prompts with color. 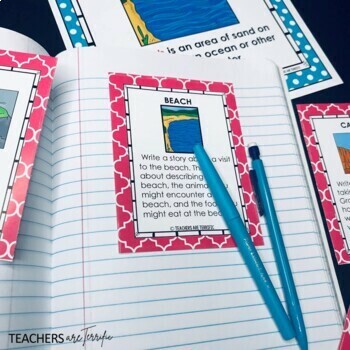 This package works great as a way to practice landforms, work on writing, and as a review. 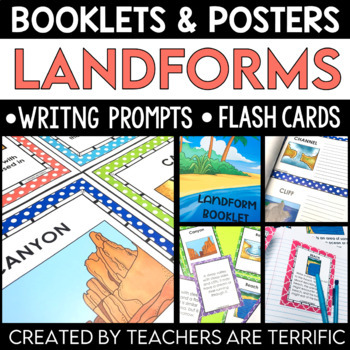 Or save money and grab all three landform resources!